This one-bedroom apartment is located in the very center of Brno. After three minutes, you will reach Janáček's theater, which is surrounded by a pleasant park with a light fountain, whose shapes and colors are particularly impressive after nightfall. Gothic Church of St. George is a 7-minute walk away, as well as the Moravian Square with the Baroque Místodržitelský Palace, where you will find the Moravian Gallery today. There is also the popular Cinema Scala on the square, where you can enjoy not only films, but also lectures and discussions organized by Masaryk University. The location is easily accessible by public transport. Tram stop of lines 1, 3, 5, 6 and 9 and night lines 90, 91, 92 and 93 is three minutes away. If you are traveling by car, you can park for free in front of the house. Nearby you will find restaurants, cafes and bars as well as theaters, galleries, groceries, pharmacies or ATMs. The landlord also lives in the same house, so he can advise you where to go for a good coffee or beer. The cozy studio is decorated in bright colors, contrasting nicely with dark parquet floors. In the morning you wake up in a comfortable double bed, which is separated from the rest of the apartment by a wall. You will heat up the pan on an electric stove, take a couple of eggs out of the frige-freezer and break them into the pan. The kitchenette is also equipped with an oven and a microwave. In the bright bathroom you will enjoy a refreshing shower and when you go out, a wonderful breakfast is waiting for you. You can enjoy it on the sofa-bed while watching morning news on TV. Beneath the window overlooking the garden stands a desk that may serve as a home office. There is also enough storage space - a spacious wardrobe and a pantry. For long-term rent (two months and more) is possible a discount. Die Wohnung wurde angemietet für ein Auslandssemester. Die Wohnung wirkt auf den Fotos größer als in Natur. Sie liegt im Souterrain, das Wohn-/Schlafzimmer hat ein Fenster zum Garten. Im Vorflur im Souterrain/Keller stehen leider teilweise übel riechende Mülltonnen direkt in der Nähe der Wohnungstür. Eigene Klingel an der Haustür fehlt u. wohl auch eigener Briefkasten. Die Wohnung ist insgesamt sehr ordentlich und sauber, nett eingerichtet. Die Lage der Wohnung ist fußläufig zur Innenstadt und ziemlich unschlagbar. Gegenüber ist eine Bäckerei. Jan war als Vermieter immer sehr hilfsbereit und aufgeschlossen. Insgesamt ist die Wohnung -ebenso wie der Vermieter- sehr zu empfehlen. Vielen Dank aus Deutschland, Jan! Thank you very much, Jan! Greatings from Germany!!! The apartment is awesome and Jan is a great and helpful host. I stayed there for 4 months with my SO and Jan was always available and helped with everything that we needed. I am a world-traveler, and often I lived abroad, but I always love to come back home to my city - Brno. I understand well the needs of other travelers and will try to make your stay in Brno as great as possible. 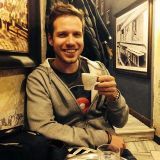 I am 30-year old, native Czech from Brno working as a programmer. I lived in Australia, United States and traveled for a few months in South America, Asia and of course Europe. I love to meet other travelers abroad, or even through couch surfing community. The apartment is on the ground floor with a view to a quiet garden with flowers. You can also use the patio and have a morning coffee (or cigarette) there if you would like. The hallways in the building are newly reconstructed. We guarantee the truthfulness of all descriptions, photos and virtual tours. The minimal stay is 30 days. The closest date you can stay until is .